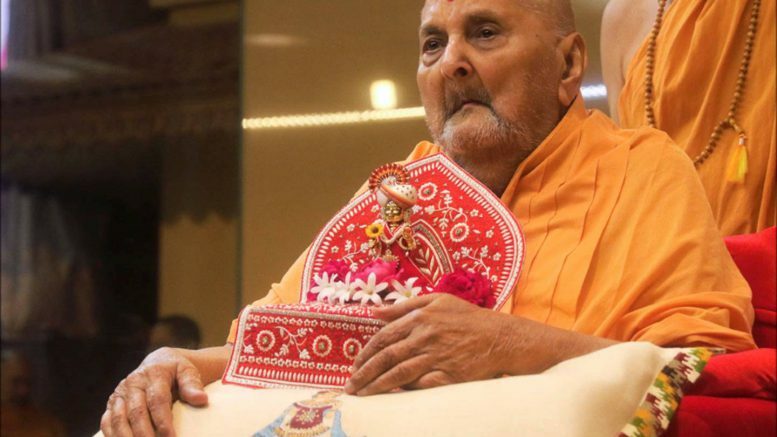 Spiritual head of Bochasanwasi Akshar Purushottam Swaminarayan Sanstha (BAPS) Pramukh Swami Maharaj breathed his last at 6 pm on Saturday at the Sarangpur BAPS Swaminarayan Temple. He was 94. Pramukh Swami Maharaj was suffering from chest infection and was advised complete rest by the doctors. Announcing the passing away of Pramukh Swami Maharaj, BAPS said in a message: “His Holiness Pramukh Swami Maharaj, spiritual head and president of the BAPS Swaminarayan Sanstha, inspirer of countless and a great servant of society, passed away today, 13 Aug 2016, at 6 pm in Sarangpur. We deeply mourn the departure of our revered guruji. Gujarat Chief Minister Vijay Rupani also expressed his condolences on the death of the spiritual leader. “Deeply pained to hear passing away of Param Pujya Pramukh Swami Maharaj. It’s irreparable loss to the society as whole. My prayer!,” Rupani tweeted. He was born on 7 December, 1921 as Shantilal Patel in Chaansad, Vadodara’s Padra taluka. He lived with his father Motibhai and mother Diwaliba. He started his schooling in 1929 in the village school and studied there till the fifth standard, to be later moved to a town school in Padra where he got admitted in the six standard. One day, he was on his way to Vadodara city to buy a cricket kit when he bumped into Ravjibhai of village Bhayli, who was incidentally looking for him. Guru Shastriji Maharaj had sent a note for him in a closed envelope. When the 18-year-old Shantilal opened it, it read: “Come over to become a sadhu.” Instead of going to Vadodara he went back home and handed over the note to his parents. The religious family who believed in this sect, found it god-sent and readied the son to relinquish world pleasures. That day was 7 November, 1939. He became the fifth scion of Lord Swaminarayan. Be the first to comment on "Pramukh Swami Maharaj Passes Away in Sarangpur"